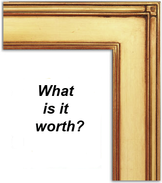 When you have acquired an art collection or are in the process of doing so, it is very important to have your artworks re-valued from time to time to make sure they are insured for the correct amount in the current art market. A.N.G. Art Consulting is pleased to offer a range of comprehensive valuation services, providing our clients with up-to-date Insurance and Fair Market Valuations to avoid incurring losses if an unfortunate event such as theft or damage does occur. It can also be an invaluable tool when you are considering the sale of an artwork(s) to have impartial advice as to the correct market value(s). If you require a current valuation for a single artwork or an entire collection, please contact Anna Groden for a quote. Valuations are priced at an hourly rate.